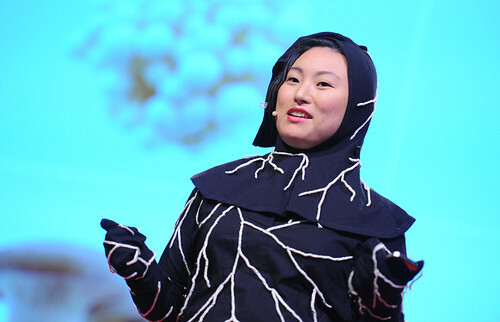 Donations will support Jae Rhim Lee's project, the Infinity Burial Project, including the Infinity Mushroom, Mushroom Death Suit, Decompiculture Kit, and the Decompiculture Society. The work of Jae Rhim Lee is a sponsored project of Fractured Atlas, a non-profit arts service organization. Contributions for the purposes of Jae Rhim Lee's work must be made payable to Fractured Atlas and are tax-deductible to the extent permitted by law. Click the icon below to make a secure donation on-line using a credit card. To send a check, please contact jrlee at mit dot edu for the correct mailing address. Here’s an image from the talk…those ninja pajamas are a new prototype of the burial suit. What is Decompiculture? Who is a Decompinaut? Decompiculture is the cultivation of decomposing organisms. The term decompiculture was coined by Timothy Myles of the Urban Entomology Program at the University of Toronto. Decompiculture as used in the Infinity Burial Project is both instrumental and conceptual. The term reflects the actual activity proposed as one element of the Decompiculture Society–cultivating fungi for the purpose of facilitating corpse decompisition. However, the IBP proposes that decompiculture is also a means of humans attaining death acceptance through the active cultivation of organisms which will eventually facilitate its decay. Decompiculture as a vehicle to death acceptance, in short. Space travelers are called astronauts, Buddhist scholar Robert Thurman calls those exploring states of consciousness psychonauts, those who seek death acceptance via decompiculture may be called decompinauts.